Or sometimes known as Duck Punching. So what we’ve got here is an arbitrary object kimsObject (line 01) thrown in the BINARYMIST global, with a public method kimsMethod (line 03). method with a new method that “wraps” additional functionality around the original method. I believe if used with care, and in moderation. Consider the developer that uses a function he/she thinks does something, but it actually does something entirely unexpected. Be sure to make known to the team and those what will use your code what you have done, and what they can expect. Make sure this is documented in code around the API, whether it be with comments or simply in the way you write your code. Jeff Atwood has a good post on the dangers of using Monkey Patching. This allows us to specify the object we want to be the prototype for our new object, I.E. our base class. 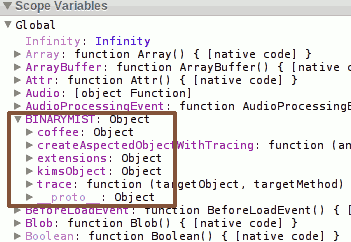 Properties added to an object‘s prototype are shared, through inheritance, by all objects sharing the prototype. prototype by using the Object.create built-in function. This also makes me think of what we try to achieve with Aspect Orientation in .NET. Below I’ve had an attempt at trying to make the BINARYMIST.createAspectedObjectWithTracing as generic as possible. 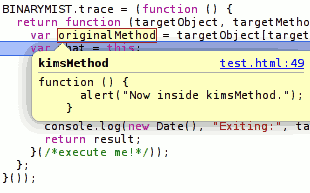 So that on the last line you can instantiate a BINARYMIST.kimsObject and call the kimsMethod method. The way I’ve setup the BINARYMIST.createAspectedObjectWithTracing, you should be able to instantiate any object and call which ever method on it that you desire. You get the tracing functionality for free. Using this sort of approach, you should be able to apply any functionality you want to any method you want. I’m keen on hearing how this could be improved. Making the call even more transparent. // We can pass any number of args to the original method we wanted to call. // We also handle any return value. So hopefully this should be able to be used for any method. // Gives us dynamic control of what a base class should look like. // method (create) that takes an object argument, returns a new object that has the parameter assigned to it's prototype. // Creates a function on Object (create) that takes an object argument. // Creates a function (Func) and assigns the object parameter to the function definition's prototype. // Instantiates and assigns the new function (Func) to the "create" function definition on Object. // Instantiate your object (any object) and call a method on it. Now as you can see again, all of the objects I’ve defined are sitting tidily out of the global object. Now as you can see below, our BINARYMIST.kimsObject is now part of the new object’s (that localObject references) prototype object. and it’s method is clearly visible. 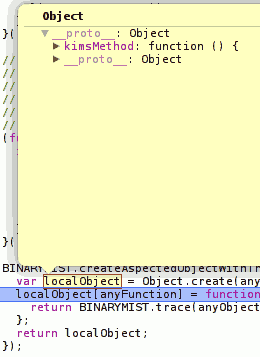 On line 42 above, we set the localObject‘s kimsMethod to reference a wrapped version of BINARYMIST.kimsObject.kimsMethod. The wrapped version has the tracing added. which has the functionality we just set. and as you can see below, we’re now ready to start playing with our target method (kimsMethod). We then assign the this. We then execute the anonymous closure. In doing so, this is bound to the global object. So to access the outer scope we need the that. We then apply the originalMethod to that (BINARYMIST in our case). originally discovered by Moses Schönfinkel. The programming language Haskell named after Haskell Curry is a purely functional language. So the concept of Currying has it’s roots in functional programming. It seems that the concepts of Currying and Partial Function Application are often used interchangeably, although they are different. Lets try and shed some light on the confusion. When it comes to functional programming languages, strictly speaking we don’t so much use the terms calling or invoking a function. As you can see in the next example, calling or applying a function has the same effect. Lines 36, 40 and 45 all do the same thing. // Call or invoke your function. // Real coffee provides great taste and a good buzz. // Instant coffee provides terrible taste and minimal buzz. // I don't recognise pseudo coffee. It's attrbutes could be anyones guess. In essence, how we code a function call / invocation is syntactic sugar for the slightly longer form “function application”. returns a function which behaves like the function you pass in but which takes fewer arguments, because the others have been bound into the returned function. takes a function and from it builds a function which takes fewer arguments. Now we could continue with the same theme as above, but for the purpose of providing easy understanding, I’m going to use a simpler theme. I’ve seen the add function used a few times to explain the topic, so I’m going to use it as well. Don’t get to caught up on the C# examples, as I’ve never had a need to curry in C#. They’re just there to provide some contrast. // Time to wind the call stack up. // Time to un-wind the call stack. // Because of C#'s static typing, we need 3 overloaded methods. is creating a function that understands partial application and implements it. builds functions which take multiple arguments by composition of functions which each take a single argument. Now the function that takes the single argument is on line 48. The composition of functions is performed in the same function where we return that (which is the original add applied to the parameter of 9 for the first test). So in this function we actually return add applied to 9 concatenated to 6. The original 9 is held in argumentsArray. I’ve also modified the add method to be a little more flexible and deal with n number of arguments. // First up we add a method to Function's prototype. // Add the function (func) as a property of Function's prototype object. // This is our add method repeated from above. // Second we add a function called curry to the global Functions prototype. // Because we want to concatenate 2 lots of the arguments, we need arguments to be of type Array. // Because the arguments parameter is not a real array, we need to borrow the slice method from Array.prototype. // Create an array from arguments. // In our case, this is bound to add because it's add's prototype's curry method that we invoked. // We now apply add (which is referenced by that) to the current scope, which is the curried function (add9, in this case). // Execute the curry method which is a member of add's prototype. // Single-step currying. Works with any number of arguments. Currying in C# feels a little awkward. If you are making calls to a particular function with some of the same arguments every time. You could dynamically create a function that holds on to the previously repeated parameters, thus saving you the effort of passing them every time. This function will supply the original function with it’s saved parameters, so the original function has the full set. Currying is not really needed in C#. The examples provided are for academic purposes only. This post also provided some clarification.